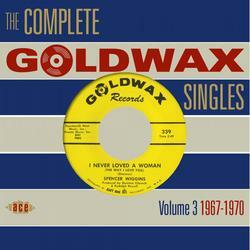 The third volume of the Goldwax singles is the story of music industry decline. If not exactly riches to rags – Goldwax sales were never that good – it is the tale of an independent label slowly losing its way in an increasingly difficult environment. This was not just about a failure to sign talent, but about changes within the business, and that meant that it became more difficult for regional independents to survive and thrive. The label was effectively over by 1969 and completely over by 1970. The artists had moved on, been sold on or simply left without a label. The final side on Goldwax was James Carr’s ‘Everybody Needs Somebody’ a country soul ballad of exceptional quality, and is typical of how high the quality remains throughout volume three of “The Complete Goldwax singles.” There are errors and side-steps, but until the day the doors swung shut for the final time the sounds of the label were almost always a joy to the ears. This is southern music at its’ very best.